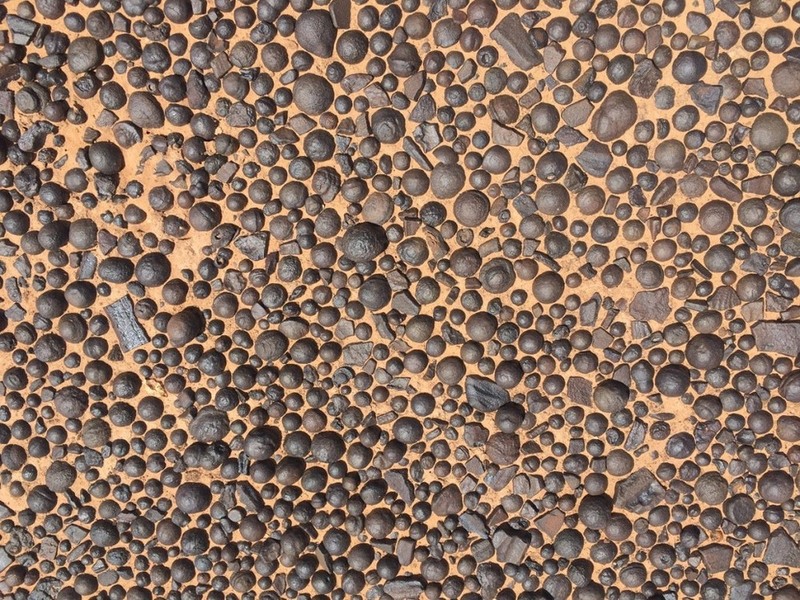 Across many places in southern Utah, in the western United States, where the orange-colored sandstone gives way to the spectacular white- and pink-colored cliffs and bluffs of Navajo Sandstone, one can find hundreds of iron spheres either embedded in the rock or gathered loosely into “puddles” on the ground. They range in size from fraction of an inch to several inches in diameter. They are called moqui marbles. The word “moqui” comes from the Hopi Tribe, and it means “the dead” in the Hopi language. The Hopi Tribe itself was known as the Moqui Indians, named so by the early Spaniards, until their name was officially changed to Hopi in the early 1900s. According to one Hopi legend, Hopi ancestors’ spirits return to Earth at night and play marble games with these iron balls, and in the mornings the spirits leave the marbles behind to reassure their relatives that they are happy and content. Moqui marbles are also known by various names, such as Navajo cherries, Navajo berries, Kayenta berries, Entrada berries, Hopi marbles, Moqui balls, and Shaman stones. Geologists call then concretion. 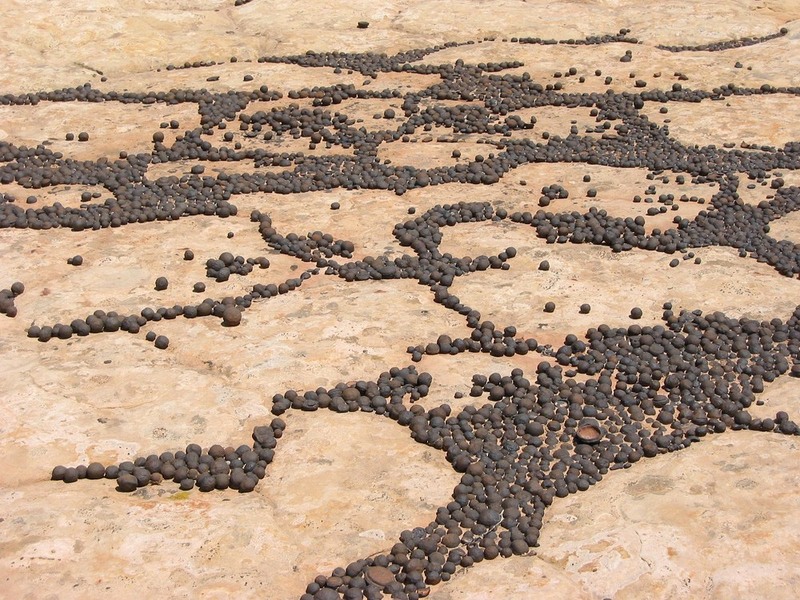 Moqui marbles are composed of sandstone cemented together by hematite, an oxide of iron, and usually surrounded by a hard shell of iron oxide minerals. The sandstone was originally deposited around 180 to 190 million years ago as a huge sand dune field, similar to the Sahara, that covered parts of Utah, Arizona, Colorado, Wyoming, Idaho, Nevada, and New Mexico. Flakes of iron-rich minerals blew in from the surrounding and became buried along with the quartz sand. Eons later, the iron fused with the grain sands giving the Navajo Sandstone its amazing colors and patterns. When the Navajo Sandstone was still forming, water containing reducing agents like hydrocarbons and weak acids percolated slowly through the permeable sandstone, bleaching the red rock by dissolving the iron into the water. This iron-laden water eventually flowed to a place where the groundwater chemistry changed and caused the iron to precipitate. 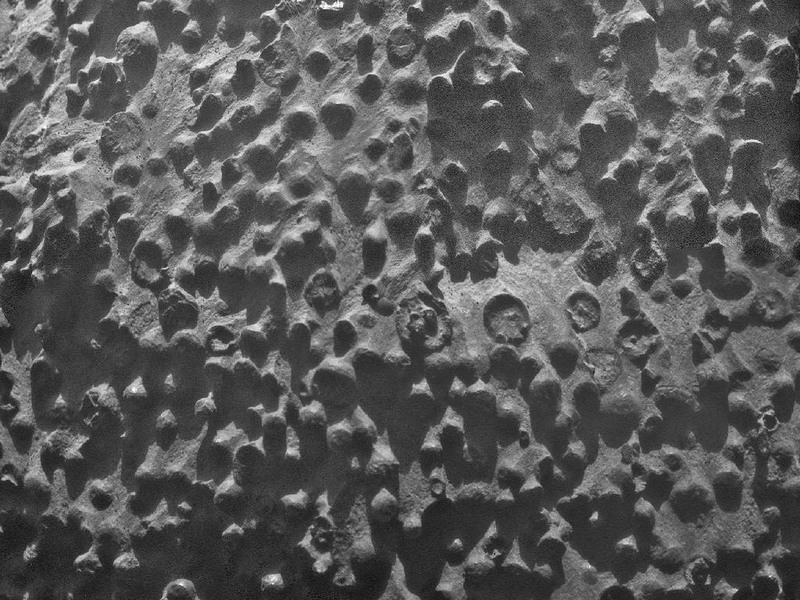 This precipitated iron surrounded and cemented the sand grains and in time formed iron concretions consisting of concentric layers of hard iron minerals enclosing loosely to well-cemented sand. 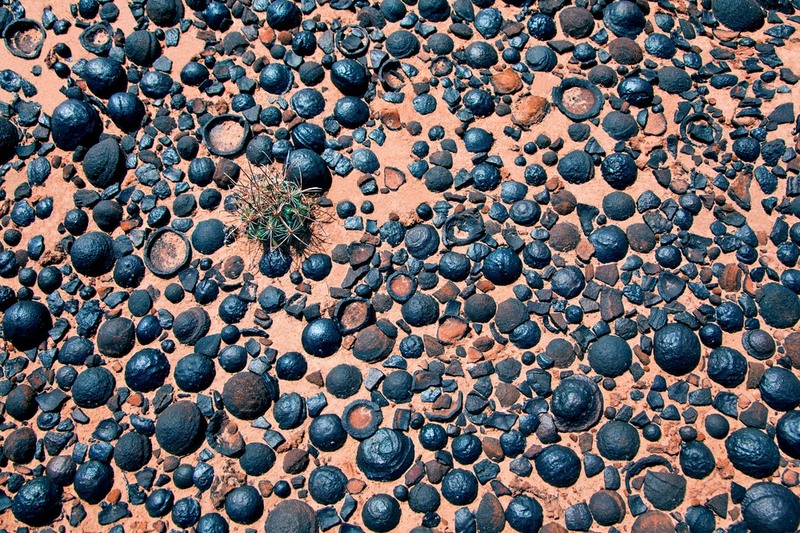 After the concretions formed in groundwater, the surrounding Navajo sandstone slowly eroded away over millions of years, exposing the erosion–resistant concretions that accumulated on the ground, often in great numbers. According to a recent study, the moqui marbles are no more than 25 million years old, while those found on Arizona's Paria Plateau are as young as 300,000 years old. Concretions are found all over the world, and even beyond this planet. 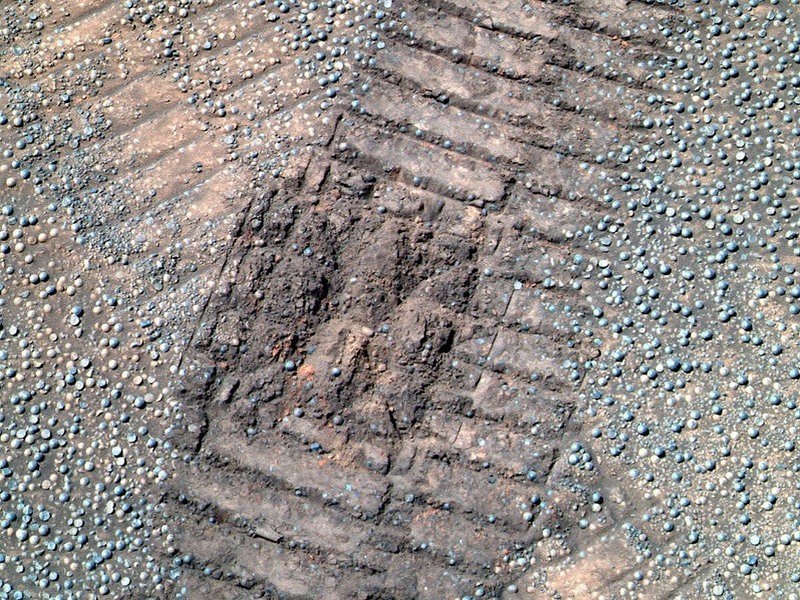 In 2004, NASA’s Mars Rover found concretion in Mars, which scientists have named Martian blueberries. It is thought that the Martian variety formed in a similar manner as their terrestrial counterpart, providing evidence that Mars once had a wet surface. 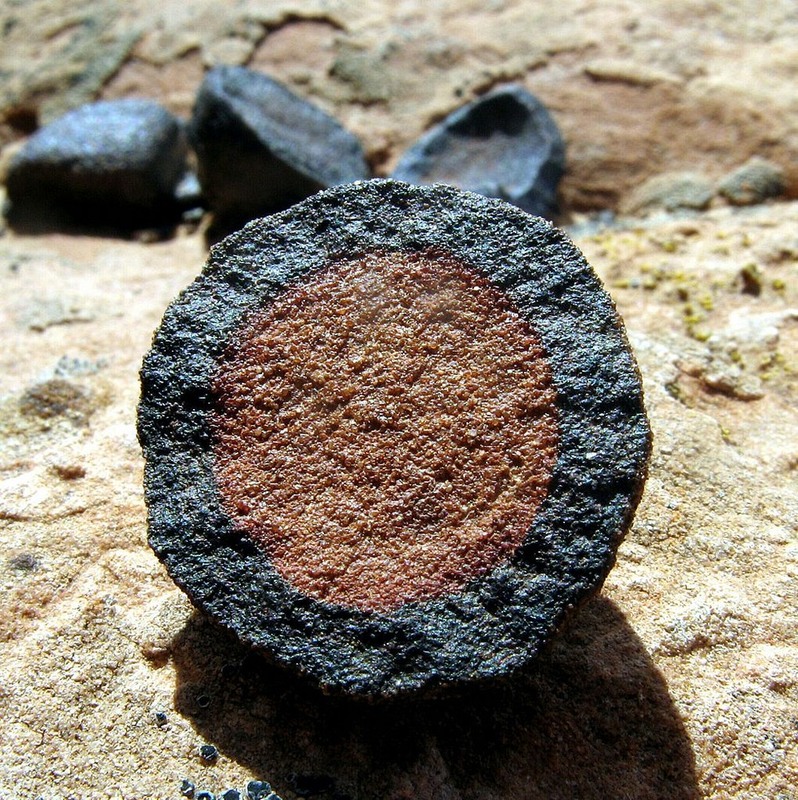 There is also evidence that certain bacteria and microorganisms can help precipated iron to form concretaion—a fact that will certainly bear on the search for evidence of past life on Mars. 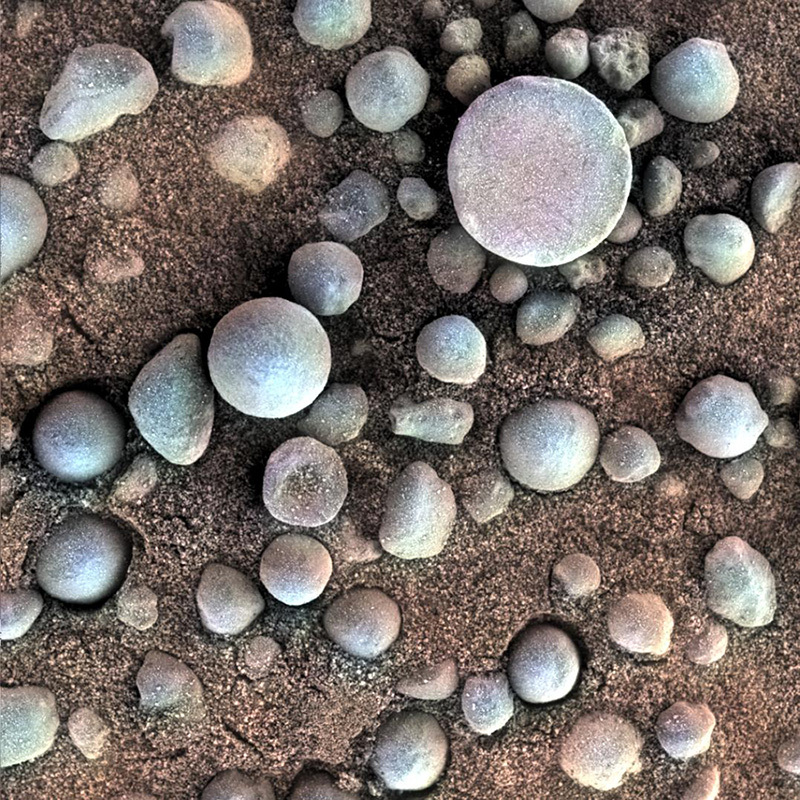 One major difference between Martian blueberries and moqui marbles is that the Martian variety is probably made of pure hematite, while the moqui marbles are mostly sandstone, cemented by hematite that makes up a few percent to perhaps one–third of the rock.